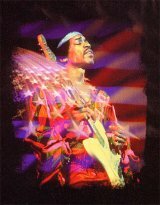 It's an image of Jimi playing his guitar with the american flag in the background printed on a short sleeved black T-shirt. If you were at Woodstock, you remember how Jimi Hendrix electrified the crowd with his enthusiastic rendition of the Star Spangled Banner. These two "books" contain the sheet music for Jimi's electric guitar version of the Star Spangled Banner (and other goodies). Jimi Hendrix: Experience Hendrix Performed by Jimi Hendrix. For guitar, voice, bass guitar and drum set. Format: complete score songbook. With guitar tablature, standard notation, vocal melody, lyrics, chord names, bass tablature, drum notation, guitar notation legend, bass notation legend, drum notation legend and performance notes. Psychedelic Rock, Hard Rock and Classic Rock. Series: Hal Leonard Transcribed Scores. 368 pages. 9x12 inches. Published by Hal Leonard. Jimi Hendrix: Live At Woodstock Performed by Jimi Hendrix. For guitar and voice. Format: guitar tablature songbook. With guitar tablature, standard notation, vocal melody, lyrics, chord names, guitar notation legend, introductory text and color photos. Psychedelic Rock, Hard Rock and Classic Rock. Series: Hal Leonard Guitar Recorded Versions. 200 pages. 9x12 inches. Published by Hal Leonard.